Welcome to Cancun Fishing Charters, the most comprehensive website for top-quality Cancun and Riviera Maya fishing charters and excursions. Join us for some of the world's absolute best fishing opportunities. 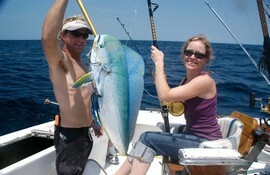 We offer a wide variety of fishing charters including deep-sea offshore fishing and fly casting. We work only with the most highly-accredited and experienced charter captains in the Yucatan Peninsula. If you are vacationing to Cancun or any of its surrounding areas, do not miss your chance to participate in what expert anglers throughout the world hail as some of the best fishing around. See for yourself what all the hype is about when you jump aboard a luxurious fishing charter yacht and join our outgoing and knowledgeable fleet of fishing captains for a Cancun fishing adventure that is sure to become the highlight of your trip! 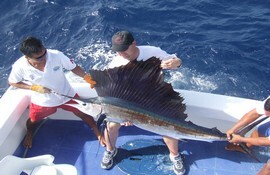 In just of couple decades, fishing in Cancun has garnered a wide reputation as one of the world's top destinations for sportfishing due to the sheer abundance of marine life that is found off the waters of the Yucatan Peninsula. These Western Caribbean waters are rich in nutrients and warm throughout the entire year. They offer ideal conditions for the wide variety of fish species that make their home here. 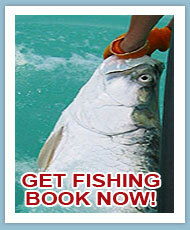 These are also ideal conditions for anglers who are eager to experience the excitement of a Cancun fishing charter. 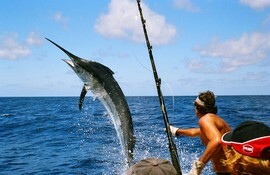 In fact, fishing in Cancun is known to be excellent throughout the entire year. There is no “on” season or “off” season in Cancun. Browse our website and explore all the great fishing excursions we have to offer you in Cancun, Cozumel, Playa del Carmen, and the Riviera Maya! Also featured in the magazines: Sport Fishing! 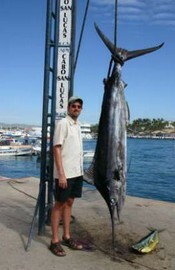 Cancun is the place to go if you want to experience excellent fishing. But with the soaring popularity of Cancun fishing charters, many so-called captains have started subpar operations taking Cancun visitors out to sea without really knowing the ins and outs of Cancun fishing. Here at Cancun Fishing Charters, we work only with Cancun charter captains who have the years of experience and the level of dedication to make them qualified charter captains. You can be sure that when you go on a Cancun fishing excursion with one of the captains on our site that you will be heading out to sea with one of the most knowledgeable, experienced, and expert fishing captains around. 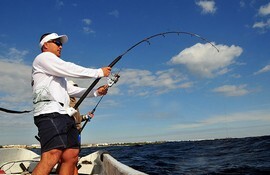 All of our captains have excellent reputations among both local anglers and visiting anglers. Whether it you choose offshore fishing, light tackle fishing, or fly fishing, our fishing charters offer you a smooth ride on a comfortable and upscale fishing vessel that is fully equipped with the proper fishing gear for the type of excursion you booked. While any fishing trip in Cancun can be successful, it takes a truly knowledgeable and experienced captain to take you on the kind of Cancun fishing trip you will not soon forget! Each of our captains has been fishing the waters off the coast of Cancun and other parts of the same area for over years! It is this level of practice and experience that allows these charter captains to successfully navigate the waters and help you find that perfect catch! Furthermore, using Cancun Fishing Charters provides you with the flexibility you need to accommodate fishing excursions into your vacation. We also provide you with the highest level of customer service and professionalism from a friendly, bilingual staff. Booking a Cancun fishing charter should be a simple and pleasant experience, and here at Cancun Fishing Charters we make sure that you are attended to promptly, respectfully and effectively from the time you start booking your charter to the moment you get off the fishing boat after a long day of non-stop Cancun fishing! Explore the different fishing options available below or call us and we can help recommend one for you!